But…just what are the A/Z Reports? Aldnoah.Zero was formally announced on February 16, 2014, following two years of development. The website was opened, and the first key visual of an orange coloured mecha was unveiled in Shibuya (QFRONT). It was announced as another collaboration between the director and writer pair responsible for Fate/Zero: Aoki Ei and Urobuchi Gen. This time, however, Urobuchi was listed as providing just the ‘original story’. The studios involved were A-1 Pictures and Aoki’s own TROYCA. Following this initial reveal, more information was to be announced at an AnimeJapan stage event, at Tokyo Big Sight on March 22. In the meantime, however, the marketing team began releasing information through on the web and various stores across Japan in the form of A/Z REPORTS, providing teasers about Aldnoah.Zero through five types of media – visuals, text, web-based (images), video and sound. The reports distributed in stores obviously only contain visuals and text, which can be categorised into two types: real world information and in-universe documents. You can find all of the former (interviews with Aoki, Urobuchi, Takayama and I-IV; and comments by Aoki and the cast about the characters) on the website. However, for the latter — mostly reports by Wolf Areash and the materials he has collected as part of his spying mission on earth — only the visuals are available online, some of which need to be unlocked using “decode keys” obtained from the REPORTS. Areash’s reports are available in Book 2 of ArchiveZ, though some are a little difficult to read because the text is really small. Director Aoki Ei’s interview (= Tx/001 on the website) included. Report by Wolf Areash, on what the situation is like on Earth (most people have gotten too used to the false peace etc). In the interview, we learn that the project began during the production of Fate/Zero, when Aniplex producer Iwakami Atsuhiro approached Aoki with the proposal to make a mecha show centered around teenagers. Aoki felt that he was thinking of a show about ‘real robots’, and they started discussing ideas. To Aoki, the advent of ‘real robots’ in a genre previously dominated by ‘super robots’ brought themes of war to the mecha genre. But at the same time, they didn’t want it to be too realistic (i.e. about trained soldiers in a war environment), which is why Aoki wanted to look at how teenagers who wouldn’t normally be fighting are changed when they get caught up in a war. And since Urobuchi was good at writing about war, Aoki took on the responsibility for developing the characters. Aoki also notes that whilst Edgar Rice Burrough’s novel, A Princess of Mars, was one of the reasons they chose Mars as the ‘other planet’, the story is different. For an original anime, the planning stage is the most difficult because you have to come up with a show/story that everyone wants to work on. This was the same for A/Z. The most difficult element was the mecha, because you have to decide on every little thing and make sure that it is feasible, from height to the size of the bullets. Wolf Areash’s second report. Dated March 22, 2014, it goes further into how and why people on Earth are not ready for war. Inaho’s timetable and student card are also included to show that history classes in Japan now cover more world history, and that they have military practice on Tuesdays and Thursdays (these can be unlocked by entering the decode key provided on the website). When asked how he and Aoki worked together at that early stage, Urobuchi notes that, instead of him writing based on what he thought Aoki wanted, the director himself threw out a lot of ideas and requests, so that’s what he worked with. What Aoki is most interested in is a story that looks at the views and desires of its protagonists. On the other hand, Urobuchi had been taken in by the keywords of “Taiga Drama” and “Histories of War,” which led to him looking more at the big picture – world views etc. But in the end, Aoki’s input brought the focus back to looking at human relationships within that wider canvas. He notes that Aoki exceeded his expectations in bringing his scripts (for the first three episodes) to storyboard. The small misgivings he’d had about what he’d written were all put to rest by Aoki’s work. The core of the story is about how two young men are connected to each other, and how that connection changes over time. And that really hasn’t changed. In other words, Aldnoah.Zero is about human relationships, and about how war changes these two young men. And not just in positive ways. Because that’s the nature of war and what it does to people. Mecha designer I-IV’s interview (= Tx/004) included. Wolf Areash’s report is about the Kats created by Earth. The locked item on the website is the United Forces of Earth (UFE) flag. I-IV (NB: pronunciation = “I-four”) talks about how he got involved in the project through Aoki’s invitation, how he went about coming up with the mecha designs, the points of focus he had etc. He also discusses the Sleipnir (1st key visual had been revealed 2 months earlier), which is lightly armoured on top of the breast plate – where the cockpit is – because it had originally been designed with the assumption that any threats to it would come from the ground, rather than from another Kataphrakt. He also points out that robotics has actually progressed quite far in the real world, so he also used RL robots as reference material, e.g. for movement. interview with Takayama Katsuhiko (Series Composition; = Tx/005) included. At the start of the interview, Takayama notes that this role can be thought of as “script director” (just as one might be a sound director, director of photography etc). He later makes the point that quite a few people contributed ideas to the story. Whilst Takayama is someone who thinks about series composition as it would work for TV, Urobuchi doesn’t put things together like that – the stories he writes isn’t bound the format, so they’re ‘twisted’, in a manner of speaking. Takayama notes that he’s kinda afraid of writing in that unbounded manner. When asked to describe Aoki in a nutshell: “he’s very good at depicting what normal life looks like, thus making the departure from normal life stand out even more.” Because of this, Aoki’s ideas about how he wanted certain scenes to proceed would influence the script as well. The most difficult thing he’s encountered with A/Z is trying to write the scripts from Urobuchi’s story outline, because Urobuchi’s the sort of genius who bases his stories on particular ideas. Those ideas, whilst not made explicit, can be grasped from the story — what’s difficult is how to bring them out further through the details that he (Takayama) had to write. Magazine about the tension between Earth and Vers, published by Harmony publishing group. The cover is a new key visual (Vs/008), with previous key visuals making up the pages of the magazine. Locked item: an image of the reports written by Wolf Areash. The final report observes that they are about to carry out their primary mission. 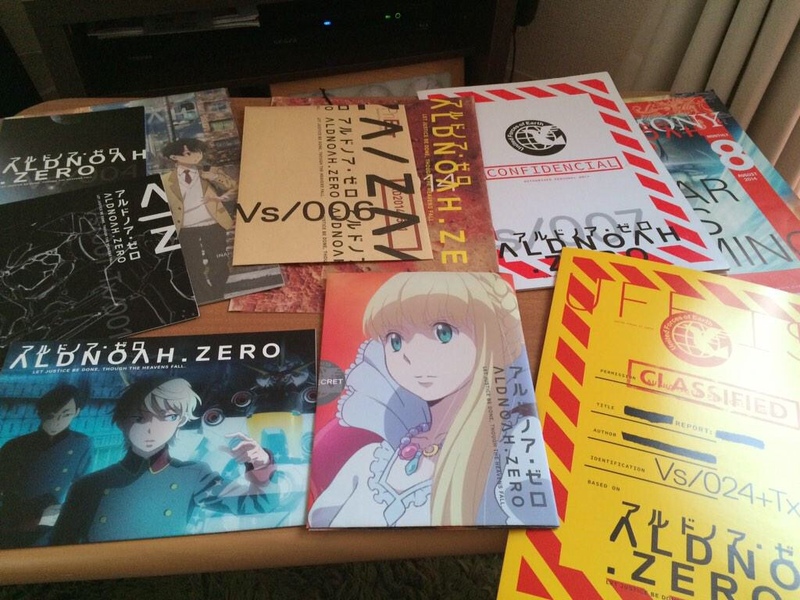 ALDNOAH.ZERO: COUNT TO A/Z preview program, also available on BD/DVD vol.1. NB: More visuals were released after each episode of the anime aired. You can find these on the website. ^^ Also, discussions of these visuals and more summaries of Wolf Areash’s reports can be found here and here.